Lemon, honey and ginger tea is a refreshing beverage that is often used to help ease cold and flu symptoms. Each of the ingredients have unique, natural medicinal qualities and when they are combined, they create a soothing tea that can relieve symptoms and boost the immune system. Lemon, ginger, honey tea can also provide health benefits for those not suffering from a cold or flu. Lemon juice is a source of vitamin C, an antioxidant that is vital for a strong immune system. 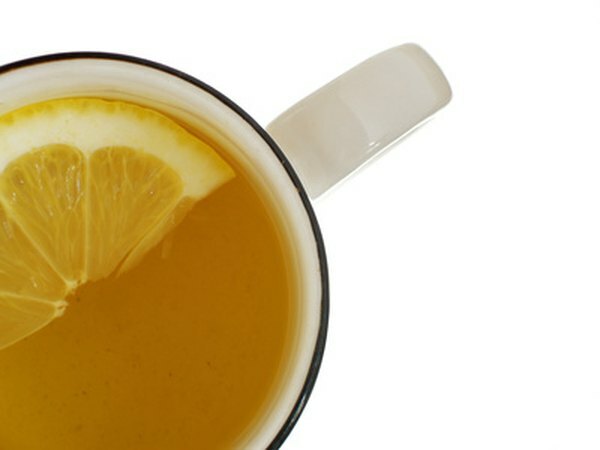 When added to tea, lemon juice can provide your immune system with a much-needed boost. The vitamin C in lemon juice can also help neutralize the activity of waste products called free radicals in the body, reducing inflammation and swelling caused by free radicals in the body. By stemming damage due to inflammation in your body, vitamin C may decrease the risk of heart disease, stroke and cancer. Traditionally, ginger has been used for the relief of nausea, upset stomach and digestive distress. However, this root plant also has other therapeutic properties as an antioxidant and an anti-inflammatory. Ginger can promote a healthy sweating that aids in the detoxification of the body, which is often helpful when suffering from a cold or flu. Ginger is also helpful for settling upset stomachs as well as dizziness, nausea, vomiting and cold sweating, which can accompany digestive problems. Honey has a soothing effect on sore throats, making it an effective and natural cough suppressant. It may also boost the body's immune system by aiding in the production of white blood cells. This improves your ability to fight infection and helps reduce fevers. The natural sweetness of honey also balances the tartness of the lemon and the ginger’s spice, giving honey, lemon and ginger tea its soothing flavor.